Book DescriptionThe Queen's Gambit Accepted (QGA) is Black's simplest way of dealing with one of White's most fashionable openings, the Queen's Gambit. Black grabs the gambit pawn and thus refuses to succumb to the passive positions so typical of the Queen's Gambit Declined. This direct and uncompromising way of playing gives rise to dynamic positions where both sides have excellent chances to play for the win. It's no surprise that the QGA has attracted many high-class advocates, including Garry Kasparov and Vishy Anand. In Starting Out: Queen's Gambit Accepted Alexander Raetsky and Maxim Chetverik take a fresh look at this famous opening. The early moves and ideas are introduced and care is taken to explain the reasoning behind them, something that is often neglected or taken for granted. 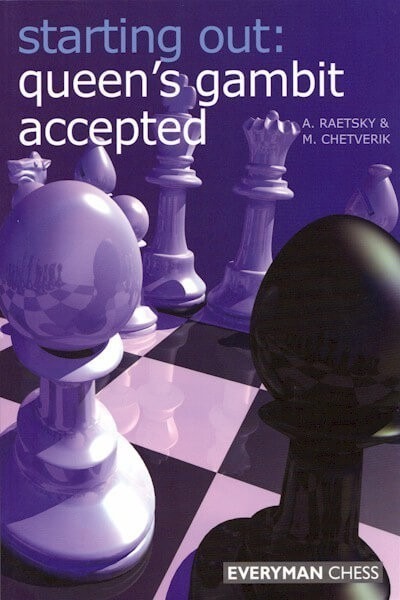 As with previous works in the popular Everyman Chess Starting Out series, the reader is helped throughout with a plethora of notes, tips and warnings highlighting the vital characteristics of the QGA and of opening play in general.